Two separate genetic analyses have found evidence for a surprising genetic link between the native populations of the Americas and Oceania. The DNA of some native Amazonians shows significant similarity to indigenous inhabitants of Australia and Melanesia. The two research groups, however, offer contrasting interpretations of how the Americas were first peopled. The studies have been published in the journals Science and Nature. 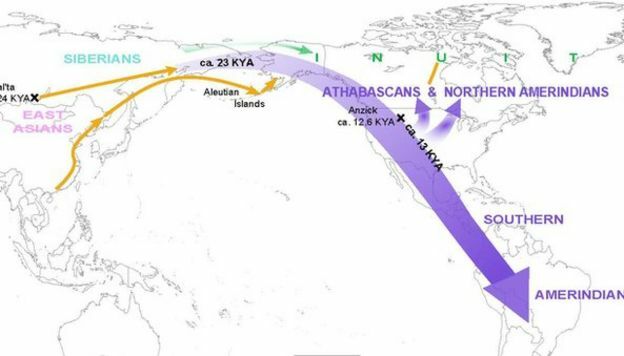 There is agreement that the first people to populate the Americas came though Siberia – along a land bridge connecting it with Europe and Asia. But just where these people came from and when they arrived has been a matter of some debate. Could this have been the route of the first Americans? By analysing the DNA of modern native Americans and ancient human remains, the group writing in Science concluded that all present-day Native Americans arrived in a single migration no earlier than 23,000 years ago. Then, they argue, Native Americans split into two branches around 13,000 years ago: one that is now dispersed across North and South America while the other is restricted to North America. “Our paper shows that the simplest possible model seems by and large to be true, with [that] one notable exception,” Prof Rasmus Nielsen from the University of California, Berkley, told BBC News. The analysis also rules out a theory, favoured by some, of a staggered migration from Siberia: the first more than 30,000 years ago which was stemmed for 15,000 years because of ice blocking the route, and then a second wave when the route was clear. But, in agreement with the study in Nature, Prof Nielsen’s team does report traces of “Australo-Melanesian” ancestry in certain populations, including those of the Aleutian islands (off Alaska) and the Surui people of the Brazilian Amazon. Prof David Reich, from Harvard Medical School, led the separate study in Nature. He told the BBC that “both studies show that there have been multiple pulses of migration into the Americas”. According to Prof Reich, the discovery of Oceanian ancestry among certain Native American groups indicates that the Americas were peopled by a more diverse set of populations than previously accepted. “The simplest possible model never predicted an affinity between Amazonians today and Australasians,” he said. “This suggests that there is an ancestral population that crossed into the Americas that is different from the population that gave rise to the great majority of Americans. And that was a great surprise,” he said. Prof Reich believes that the most plausible explanation is that there was a separate migration from Australasia, possibly around 15,000 years ago. This group, he speculates, was probably more widely dispersed across North America but was eventually pushed out by other native American groups. Prof Nielsen, however, has a different interpretation. He believes that the traces of Australasian DNA stem from a later migration, around 8,000 years ago, which progressed around the Pacific coast.